On a visit to Beaufort, South Carolina with friends we decided to take a drive out to Hunting Island to visit the lighthouse. It is only about 15 miles out to the island and the drive is scenic and peaceful. 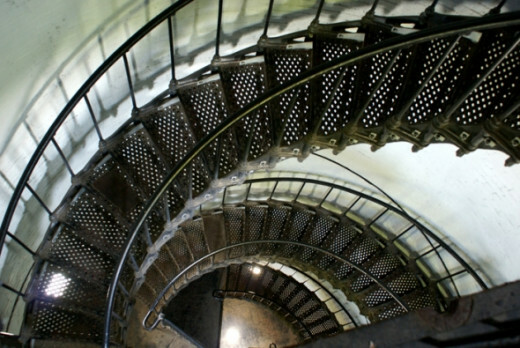 When we arrived at Hunting Island state park we decided to climb to the top of the lighthouse. Now, I love lighthouses and I have photographed more than 30 over the past four years, but I have never climbed all the way to the top. Once, in Jupiter, Florida, I climbed halfway up and took some photos from a window but I just couldn't make myself climb the rest of the way. This time I was with two friends who encouraged me to make the climb and I will tell you I am really glad that I did. The view was beautiful and the climb was not really as scary as I thought it would be. In this lens, I will share my climb with you in photographs. The climb up to the top of the lighthouse was made easier by a series of landings. You climb 19 steps to reach each of the first eight landings and then 15 steps to reach the final landing. The wide steps made of sturdy iron and the landing platforms made the climb seem easy. 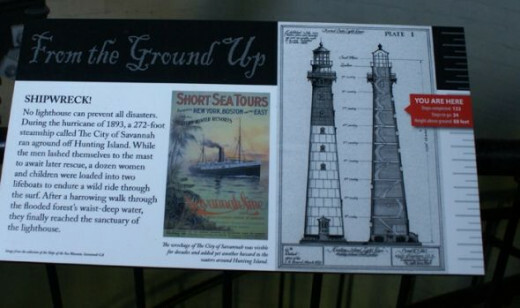 At each landing you could stop and read a plaque telling some of the history of the lighthouse. I have photographed each of the plaques and include them in this lens. 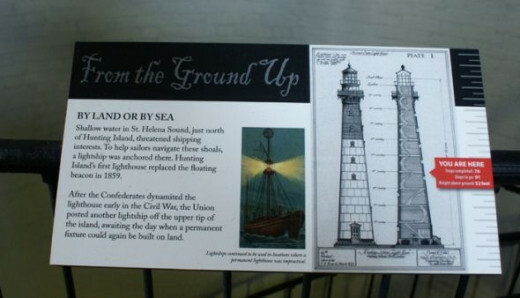 It was interesting to read the plaques at each landing this one tells of surviving an earthquake at the lighthouse. Well I've made it more than halfway to the top and now I'm determined to climb all the way. I stop here to read some more history and catch my breath. The air gets a bit cooler as I make my climb. 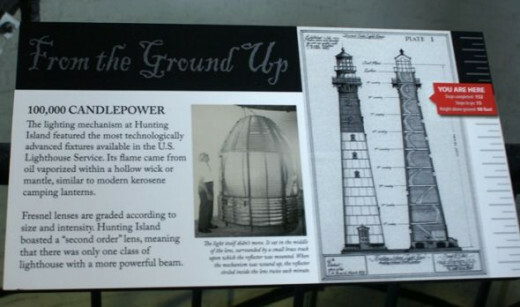 The lighthouse was needed to warn sailors to stay away from the waters of St. Helena Sound. 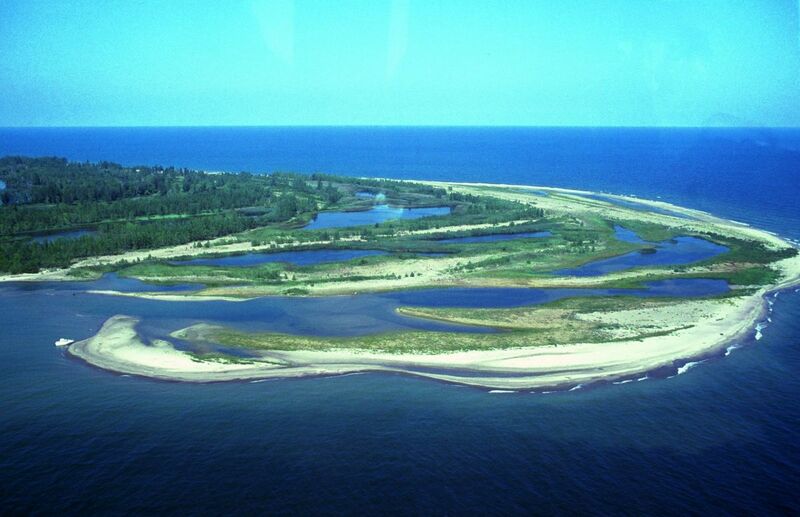 This area is too shallow and contains too many sandbars for large vessels to come to close to the shore. At this landing you read a some of the history of lights on Hunting Island. I've passed the halfway point to the top of the lighthouse when I took this photo. It seems like a long way down...but breaking up the climb with 9 different landings really helped to make the climb easier. At this landing I learn how the lighthouse was moved. Some disasters cannot be prevented by the lighthouse as I learned at this landing. The light at Hunting island could be seen 18-20 miles out at sea. It has a 30 second white flash pattern. Only one more flight to reach the galley, where you can walk out and enjoy the view from the top. The next flight to the galley has only 15 steps but I found them to be a bit narrower and the handrail ended before the last two steps. It was a bit frightening, but I made it!! The galley of the lighthouse is just below the lantern and has an iron rail that extends all the way around the lighthouse. This made it possible for the lighthouse keeper to keep the outside of the light clean. The keepers & their assistants only earned between $500 and $700 per year for their hard work. Here is a photograph I took from the top of the lighthouse looking toward the north. 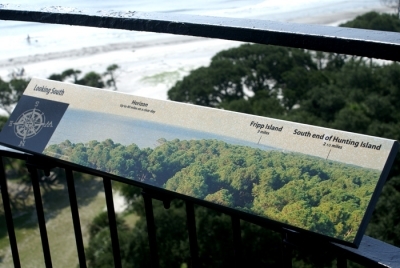 You see one of the beaches on Hunting Island in the photo. 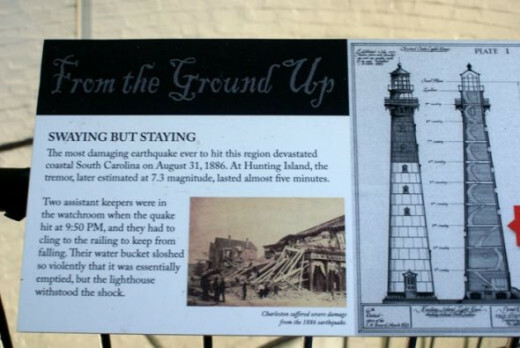 It was interesting to read how this SC lighthouse was affected by the earthquake of 1886. 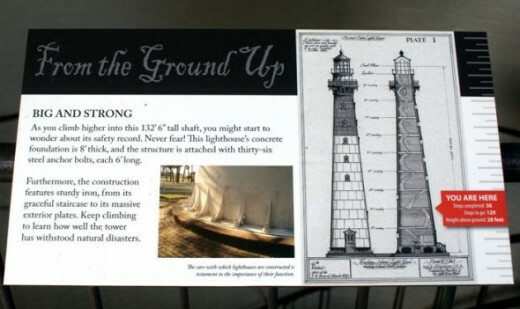 The Ponce Inlet Lighthouse in Florida was affected by the same earthquake and cracked. I haven't been to this one yet. I enjoyed your photos. Hunting Island is a great state park and I enjoyed your climb up the lighthouse and the stops highlighting it's interesting history. Gee! Climbing up to the top of this lighthouse is an adventure in itself, and the view from the top must be a great reward for the effort. I love the picture "Hunting Lighthouse Stairs", and I always like to have a map. Send Angel Dust in your way! Love visiting lighthouses! 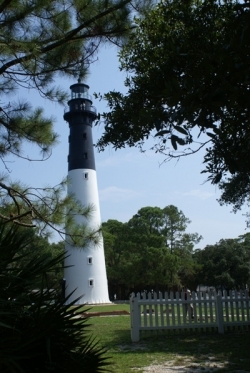 Have been to see Hunting Island Lighthouse but it was closed that day :&gt;( What a lovely state park though! I have not ever climbed a lighthouse, but it is now on my list of things to do! What a wonderful little lens you have put together here. You have been blessed. Yes, I've been to some east coast lighthouses and it was great fun to climb up to the top, though the narrow stairs make me claustrophobic. You've done a wonderful job showing us this lighthouse! South Carolina has a lot of awesome lighthouses. I love them. Yes, I have climbed the Ponce Inlet Lighthouse in Florida. It has a very scenic view. 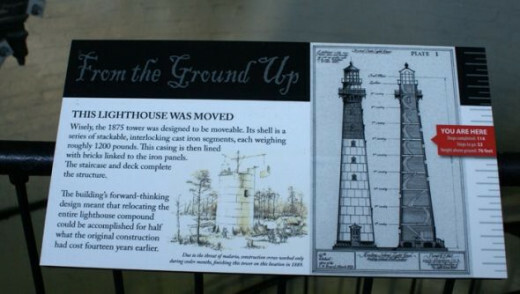 I have never climbed a lighthouse and I am afraid Hunting Island Ligthouse wouldn't be for me. I probably would make it until the first or second landing and then take my way down again. I have no problem with radio masts or something else I can reach with an elevator, but climbing up steps and being able to look down is a no go for me. Enjoyed the pictures though. Congratulations on making it to the top! You are nothing less than brave! That photo you're using in the into module is gorgeous! What a wonderful lighthouse tour! Thanks for all the photos and for sharing your vacation. No, I must admit, I haven't! I have my problem with heights, and so avoid to climb all kinds of high buildings, lighthouses included. But your article is a wonderful virtual tour which I enjoyed very much! Oh my! I am exhausted after following you on your climb to the top of the Hunting Island Lighthouse but sure did enjoy it. Your photos are excellent as usual and I love the one you chose for the magnet. I love the way it is framed with the trees, also. Blessed. Please stop by our South Carolina Group and submit this wonderful lens. I don't think I have ever climbed a lighthouse, but I'd love to try it someday. Congratulations on making it to the top! I really like your photo at the beginning, with the lighthouse framed by the trees. 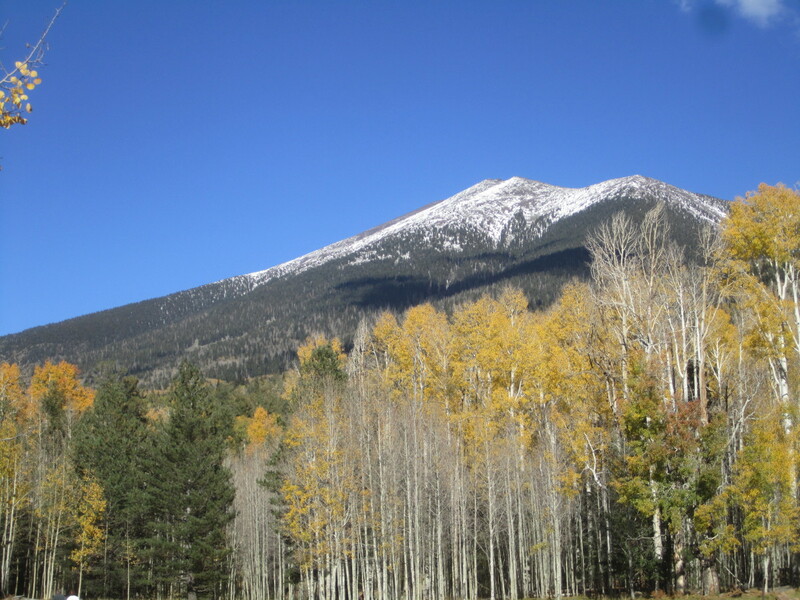 Congratulations on your fabulous climb! Gorgeous photos! Congratulations on overcoming your fears and reaching the top. What a great idea somebody had to put a little history on each of the landings. I've never climbed a lighthouse myself and not sure if I could even if I had the opportunity . Wow,quite a climb! 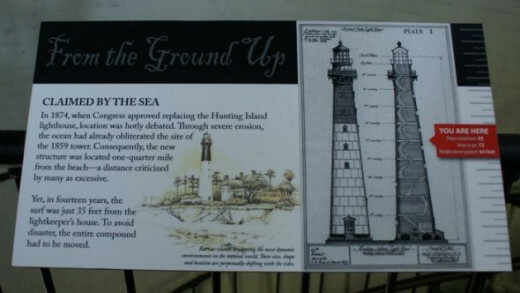 I've climbed a lighthouse but I don't think it was as tall as Hunting Island Lighthouse. Love the way it has history on each landing, and your great pictures of them! Congratulations on you first climb. My family love to climb the Cap May lighthouse. Thanks for sharing this great info. Blessed!